Just off Interstate 20 and nestled along the Mississippi River, the Rodeway Inn hotel is close to several local points of interest. 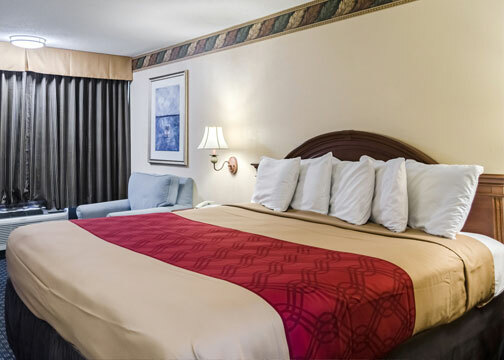 Popular attractions like the Vicksburg Convention Center and Auditorium and the U.S. Army Corps of Engineers are minutes from this Vicksburg, MS hotel. Step through the annals of time and visit the Vicksburg National Military Park that features living history exhibits, Civil War artifacts, demonstrations and the U.S.S. CAIRO Gunboat and Museum. Enjoy a variety of golf courses, parks and outdoor recreation areas nearby. There are several antique stores, specialty shops, entertainment venues, riverboat tours, restaurants, cocktail lounges and coffee shops in the vicinity; some are within walking distance to the hotel. Business travelers will appreciate modern conveniences like access to copy and fax services. Our guest rooms come equipped with coffee makers, microwaves, refrigerators, curved shower rods, hair dryers, irons, ironing boards and cable television. Handicap accessible and non-smoking rooms can be requested. Coin-operated laundry facilities are provided on the premises. Ample parking is available and can accommodate most cars, trucks or buses. Visit historic Vicksburg and make the Rodeway Inn hotel your home away from home. Our inviting accommodations, countless amenities and courteous staff are sure to please. Book a room with us today and experience our exceptional customer service. This website is owned and maintained by Rodeway Inn Vicksburg, a licensed user of certain proprietary trademarks and service marks of Choice Hotels International, Inc.